Vaccinations have played a prominent role in U.S. military history. George Washington ordered smallpox vaccine for his soldiers during the Revolutionary War. Nearly 90 percent of the deaths of soldiers during that time were caused by disease, with smallpox being one of the most prominent. It was said that more American soldiers died of smallpox than from battlefield injuries, and Washington’s plan to defeat smallpox played an important role in the ultimate victory of his army. Vaccination remains a vital tool for U.S. forces. The Defense Health Agency’s (DHA) Immunization Healthcare Branch (IHB) is a responsive, patient-centered organization that promotes excellence in immunization health care for service members and beneficiaries. IHB also supports Force Health Protection and Readiness by developing and promoting programs, services and research that enhance immunization effectiveness, safety and acceptability. Although U.S. military physicians and researchers have collaborated in the development of vaccines for influenza, rubella and typhoid fever, Collins emphasized our armed forces have had a long history of involvement with vaccines against infectious diseases. 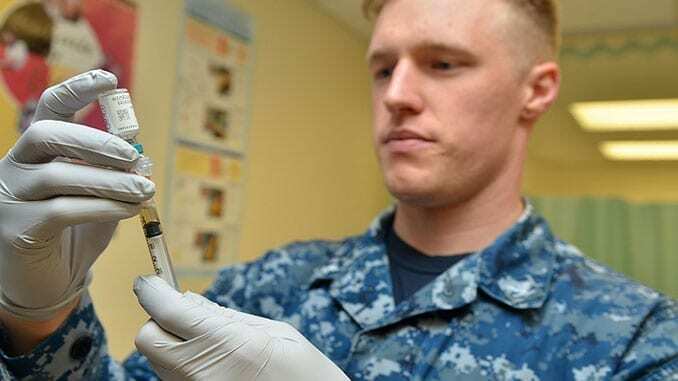 “For more than 200 years, our military has been actively engaged in vaccine research, and made many contributions to the development of products for use in disease prevention and control,” he said. During World War I, Army Surgeon General William Gorgas convened a series of commissions to gather the best civilian and military input for ongoing and recurring infectious disease problems. In 1918, a pneumonia commission was formed, and in 1941 the Army established the Board for the Investigation and Control of Influenza and Other Epidemic Diseases in the Army, which was renamed the Armed Forces Epidemiological Board (AFEB) in 1949. Article courtesy of the Military Health System Communications Office, adapted for Global Biodefense.